You are currently browsing articles tagged colombard. Thailand has many vices (recounted in banned book splendor) and an equal number of virtues, most of which are left to the reader’s imagination. Wine, whether vice or virtue, will not appear on your mental spreadsheet but should according to the 5+ bottles of Thai wine at the Khao Lak mini-market. All wines in Thailand win gold medals, if the mini-market aisle is to be believed, and all wines in Thailand do not list their grapes on the bottles. Save one. My featured bottle has no gold metal – aberration! – and sits on the bottom shelf of the wine and Chang beer aisle. Written prominently in small print on the back however is a grape pronouncement of Colombard and Syrah. Never heard of Colombard before so off went the 2007 dust and into the cart with the water and Strawberry Oreos. Suprising to this uncultured drinker, Colombard is actually a high-class grape that’s allowed into the VIP ABC French parties. A. Armagnac, B. Bordeaux, C. Cognac. Each deigns to allow Colombard into their high-priced milieu. In North America, we make it into jug wine. We classy. 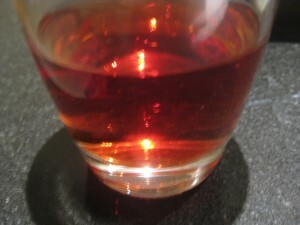 In Thailand though, they blend Colombard with Syrah to make a rose wine. 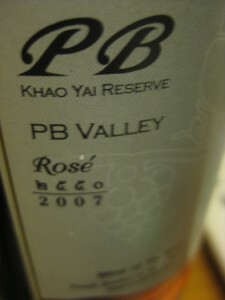 And there are at least 3 wine regions in Thailand, of which Khao Yai makes the bottle you see above. 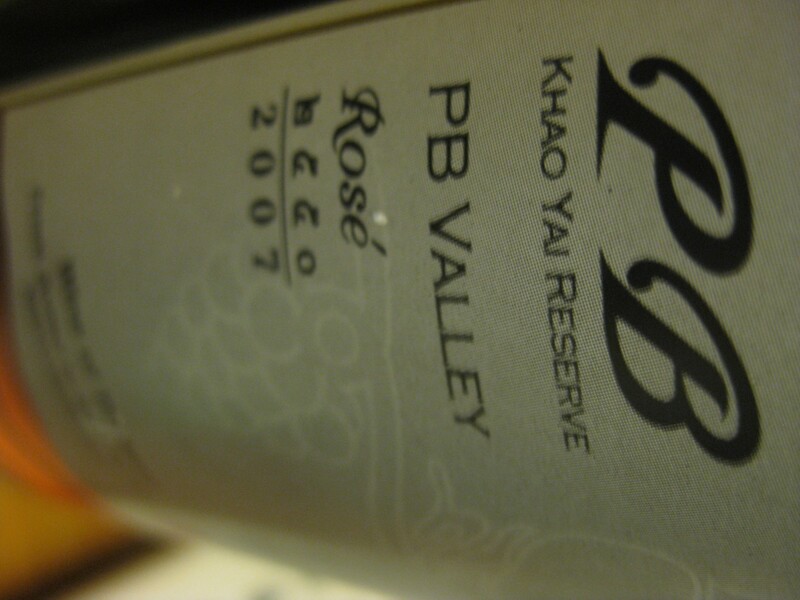 So, Thai and Colombard pair up with a blush of Syrah to form wine. Taste? Loads of acid on the front with not many other smells, texture is stupendously flat in a very plateau-centric way, and there’s a one-note symphony of sweet lychee playing like a cello on that plateau. * Khao Yai wine makers worry about things you don’t. Like elephants and gibbons. * Brits recommend Spiced carrot & lentil soup for your Colombard. Thais recommend Thai food.